We are offering a wide range of Mould Conveyor that is used for the purpose of automation in polyurethane industry like Shoe sole carriers & conveyor, fixture for refrigerators & deep freezers, Solar water heater mould fixtures etc..
We are engaged in offering an extensive range of Mould Conveyor which is manufactured in line with the latest technological advancements. With this carriers material/moulds has to be moved, conveyed, fed or turned to the pre defined motion with speed.These are fabricated using high quality material. 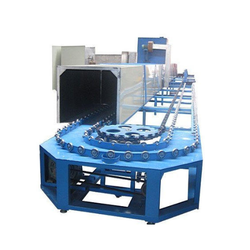 Looking for Mould Conveyor ?